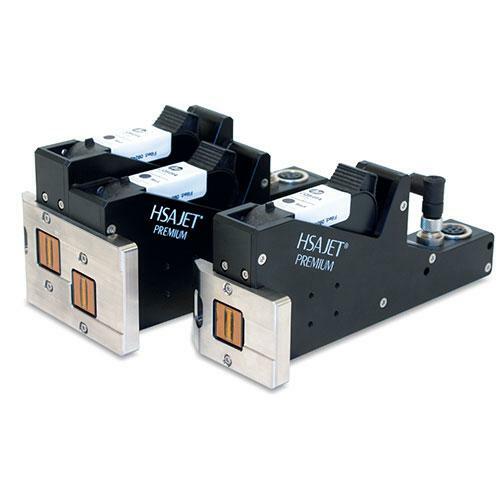 HSAJET® Premium printhead for use with a series of new printer controllers utilizing the HP TIJ 2.5 technology. The printhead is made from hard anodized aluminium with a stainless steel product foot plate. It encloses the nozzle area avoiding air turbulence and giving optimum print quality at high speed printing. Printheads can as standard be purchased with 1, 2, 3, 4, 6, 8 or 10 pens. A number of 0.5" printheads can be joined up to 5" print head arrays. HSAJET® Premium printheads are designed with more combined features than single stalls being placed side by side. The printheads are linked together, so all communication is sent to one stall, which distributes data via a small internal ribbon cable. The easy-shift feature allows change of the print cartridge with one hand and without use of a latch. The design facilitates correct insertion of the cartridge. The foot plate can easily be turned 180° if opposite print direction is required.